PC gaming is the one area where you have to be equipped with the latest technology, and you should have high-performance equipment This latest technology and high-performance equipment will provide you superb gaming experience. Playing games on PC is loved by all, and if you really want to experience 3D HD gaming, then you should have monitors with some nice features with nice 3D and HD quality. These monitors keep you more competitive and look sharp along with all the latest features you need. There are plenty of nice and amazing monitors, but we have selected best 3D monitor for PC gaming. 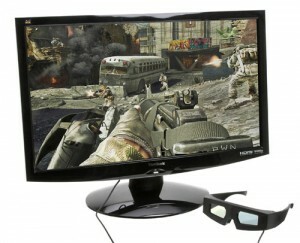 This list will help you to select the monitor for yourself so as to experience best 3D gaming. LG one of the most popular and demanded brand in the field of Electronics introduced a 3D monitor which has no dizziness which causes a real discomfort for the viewers. LG Cinema 3D monitor will allow you to go easy in 3D images for a long period without having any discomfort due to dizziness. LG Cinema 3D monitor will allow you to play HD 3D games with nice 3D gaming experience. LG CINEMA 3D Monitor D2342P is one of the best 3D monitor housing a nice display of 23 inches (58.42 cms) with a resolution of 1920 x 1080 and has 170/160 (2D), 80/12 (3D) viewing angle which makes it easy to watch it from any angle. 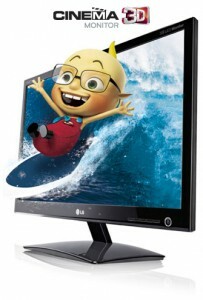 LG CINEMA 3D Monitor has 16.7M Color Depth, and its 3D glasses weighs only 16 grams, and the glasses are battery-free. LG’s CINEMA 3D glasses are battery-free and therefor it does not generate electron waves. LG has launched Cinema 3D monitor with SUPER Energy Saving technology which limits power consumption. LG CINEMA 3D Monitor D2342P is priced at Rs 15170. ViewSonic V3D241wm is a full HD monitor housing a screen of 23.6 inch along with a pair of nice wired active shutter glasses. ViewSonic V3D241wm will give a lot better gaming experience with big screen and HD resolution. ViewSonic V3D241wm monitor has solid build quality but the is one exception its plastic lip misses a rear frame to back it and therefore comes across as a little defective. ViewSonic V3D241wm is nice monitor with nice connectivity options and shutter glasses along with iZ3D software included. ViewSonic V3D241wm Monitor is one of the best option for PC gaming as it has some nice specs and features and comes in an budget price of $ 3876. ASUS one of the most renowned name across the globe brings up a nice 3D monitor equipped with some really eye-catching features. ASUS VG278H Monitor has a superb 27 inch 3D immersion with NVIDIA® 3D Vision™ 2 glasses and 3D LightBoost™ screen and has buttery smooth action with a nice 120 Hz refresh rate and 2ms tracer-free. ASUS VG278H has Vivid color performance along with Splendid™ Video Intelligence Technology and it has a elegant and classy look and its dimension are designed for swivel, tilt angle and height adjustment. 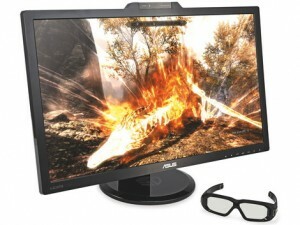 ASUS 3D monitor has its expanded connectivity via HDMI 1.4, dual-link DVI-D, and D-sub. ASUS monitor will take you to the full 3D HD 1080p world of games and there are around five hundreds PC game which is compatible with NVIDIA® 3D Vision™ Kit. Acer has also launched its 3D monitor in market equipped with high ending specs and features, Acer monitor comes with 16.7 million colors along with adjustable display angle. Acer 3D monitor houses 27-inch screen with full HD screen mode and comes with 2 ms response time along with 16:9 aspect ratio. Monitor is capable of viewing 160-degree vertical viewing angle and 170-degree horizontal viewing angle with easily adjustable display angle. Acer 3D monitor supports HDCP along with LED backlight technology and offers 1920 x 1080 resolution with 120 Hz standard refresh rate. Acer Monitor is equipped with inbuilt speakers along with VGA, HDMI, and DVI support. Samsung has also launched a nice 3D LED monitor featuring 3D technology with superb graphics and nice games experience. Samsung 3D Monitor is equipped with 27 inch LED screen with a resolution of 1920 x 1080 pixels with 2 ms ultra fast response time which provides Superb gaming experience as it prevents distortion of fast-moving video games and scenes. 3D LED monitor also has digital connectors like DVI, HDMI along with display port so that you can enjoy huge variety of entertainment. CES 2014 looked like the funeral of 3D technology, but still BenQ, Viewsonic and Asus has launched some 3D monitors in size variants of 24 inch to 27 inch.